The mile per hour picked up as I went, because the air was cooling off quite a bit. First two passes were around 7pm-7:45 and the others were all after 8:30pm. Temps got down to around low 70's. If I could get my 60ft time squared away, I'd sneak into the tens but I don't know how to do that, short of buying a set wheelie bars. Wondering if race fuel would be the ticket to give it that little boost it needs to make up that last .06 . I don't want to go lowering the bike or doing a swingarm kit. This is my daily rider with 27,000 miles and it's BONE stock. I'm curious, what everyone else's 60ft times are with the same bike, no mods. I'll post pics of the time slips later. 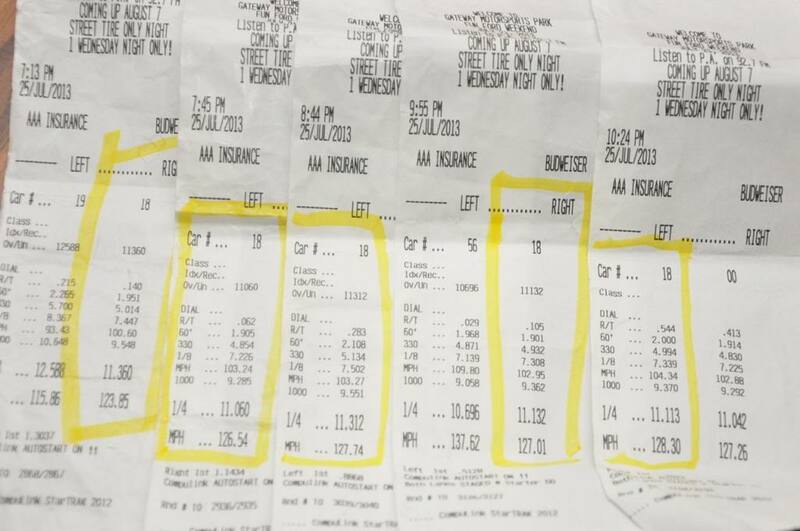 My brother's '11 GSXR600 ran 12.20-12.50 depending on his launch. It was his first time ever racing a bike. Only my third time racing a bike (first two times being on my '97 CBR F3 600 which ran a best of 11.70) He is a bigger guy at around 230lbs and a total noob street rider having just bought this bike last fall. Practice is the key to running faster times. A front strap for $25 will be the cheapest way to easily get into the 10's. It will help control wheelies and allow you to launch harder. Race gas will not help. Running about 1 gallon of 87 octane ethanol free gas is the best way. Don't go with a full tank of fuel because it just adds weight. Launch around 4k and slowly work up to 5-5.5k as you can more comfortable. Learning just how much to slip the clutch will lower your 60ft times. You should already be in the high 10's if you have low 1.9x's 60ft times. Just make sure you are waiting until right at 12k rpm to shift because this is really 11.5k since the tach reads about 500 rpm high near redline. Thanks for the tips. I'll try that next time. Where can I get front straps? Do you have a site you can recommend? My goal was to beat my brother's Nova's best e.t. of 11.22 and I achieved that. Now I wanna set the bar high enough that he can't touch it. Gotta love sibling rivalries. Check the link below. The strap connects to the upper caliper bolt and goes over the neck of the frame between the tank and triple tree then down to the other side caliper bolt. I use a large wire tire to secure the other end of the strap to the triple tree. With a lowering strap you should easily cut 1.8's 60ft and run 10.80-10.90's. Awesome! Just bought it. Thanks for your help. Gonna try it out and see what happens. At last!. There is someone else on the forums that goes out to gate way for some fun. I may not be fast, but i love the track. Bad starts and stalls for me. Ha! Small world. Got my straps the other day. Waiting for my next trip to the track to get my 10 second time slip.